An unusual life story of the man and artist in his “escape from history”, a concatenation of destiny events, when looking for a job after leaving Trieste Joyce arrived in Pulaon October 1904 and stayed till March 1905. In Pula, the Austro-Hungarian imperial royal naval base, James Joyce worked as a professor of English at the Berlitz School, teaching mainly the Austro-Hungarian officers in the town with Naval Shipyard. Already in Pula James Joyce was imbuded with the “Ulysses picture” of the modern man’s split personality. 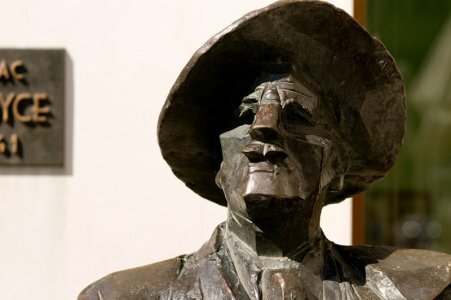 James Joyce has been sculptured in bronze by Mate Čvrljak, the sculptorfrom Labin and a representative of the contemporary Croatian sculptural arts. In the tourist town with the magnificient amphitheatre Arena, taking a photograph with Joyce in Pula is a part of everyday occurence album.